With the Supreme Court declaring Section 57 of the Aadhaar Act as unconstitutional, bank account-holders, e-wallet or mobile wallet users and mobile subscribers are no longer required to use their Aadhaar number. 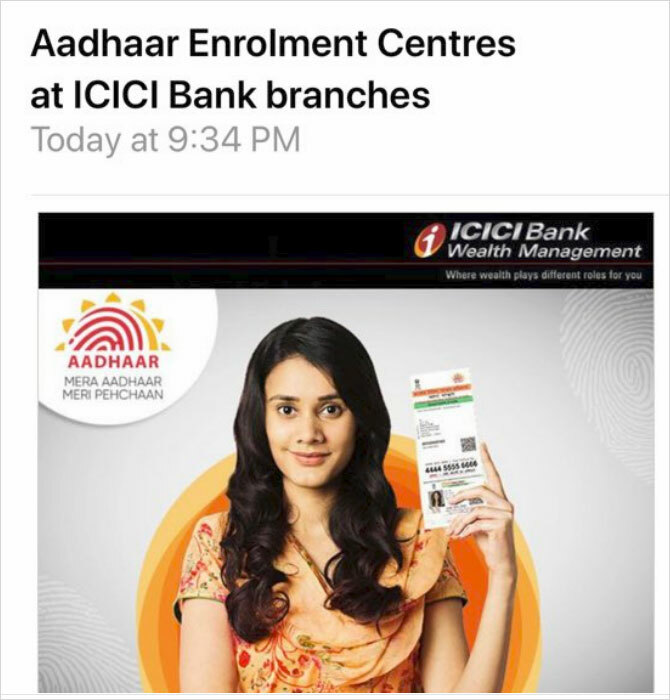 At the same time, a few banks like ICICI Bank are continuing to bombard its customers with a message to get an Aadhaar number from its enrolment centres. Mobile wallet company Paytm is still asking people for Aadhaar number. On Thursday morning, one of our readers Prasad S found four-five executives from Paytm selling account for free with just an Aadhaar number. When Mr Prasad confronted them, they backed out and said the customer can provide any other valid ID proof. c) Apart from authorising the State, even ‘any body corporate or person’ is authorised to avail authentication services, which can be on the basis of purported agreement between an individual and such body corporate or person. Even if we presume that legislature did not intend so, the impact of the aforesaid features would be to enable commercial exploitation of an individual biometric and demographic information by the private entities. 2. If there is no provision for online de-linking of Aadhaar, then use the form below and submit it to the branch manager of the bank where you have an account. Do not forget to take acknowledgement on your letter from the Branch Manager with bank's stamp/seal for letters. Since many bank branches share their email ID as well, you can send the application given below through email with a copy to senior officials in the bank. Please note that as per the order from the Constitution Bench of Hon’ble Supreme Court, Aadhaar is absolutely optional for all purposes including Jan Dhan accounts, bank accounts, mobile number verifications, stock dealings, passports, provident fund, pensions, salary, and admissions. Please see for the order of Supreme Court and other details that clearly prove that Aadhaar is absolutely optional for enrolment and linking. This application has been made in duplicate and you are requested to countersign on my copy to acknowledge the due receipt of the same. Any further dealing with my Aadhaar number or details in any manner whatsoever after the date of this application would be treated as violation of my Fundament and Statutory Rights and I reserve all rights to take legal action you for the same. In a circular issued on 26 October 2018, the Department of Telecommunication (DoT), has directed all unified license holders to discontinue use of Aadhaar eKYC for issuing new SIM and re-verification of existing subscribers before 5 November 2018. "...the use of Aadhaar authentication is not permissible for eKYC for verification of telecom subscribers not for issuing new mobile connections. In compliance to the judgement of the Supreme Court, all licensees are to discontinue the use of Aadhaar eKYC service of UIDAI both for verification as well as for issuing new mobile connections. All TSPs shall ensure its implementation across the country in a time bound manner and compliance in this regard be submitted by 5 November 2018," the telecom department said in the circular. Mera Aadhaar Meri Pehchan: But Leaked All Over the Internet! How fool proof is Aadhaar? Does it serve the purpose that was claimed? This is such a wonderful article. Thank you so much for writing such an insightful article. There is a blatant violation of privacy and we need to stop it to protect ourselves from frauds later on. Keep posting such valuable articles! When you have nothing to hide, you have nothing to fear. I do not understand why I should detach my Aadhaar and what harm its continuance would do to me. I shall appreciate if anybody could enlighten. Axis bank is still asking adhaar card number as mandatory. What action can be taken against them? Will you pleasesebd the form of letter in downloadable pdf? What about Bank accounts which are getting domestic gas subsidy? Does this subsidy comes under government welfare scheme? Yes. So far the gas subsidy you need Aadhar. thanks. what about mutual funds? Thank you for the application format! If I am not a fraud /criminal /tax offender. Why should I de-link Adhaar from anything. It made my life so simple. I will keep it willingly. And judgement is not forcing anyone for de-linking. If you are not a criminal and have not done any fraud, then why should you de-link your aadhar card ? It has nothing to do with that. It deals with your privacy concern. If your aadhar card goes in wrong hand, people can misuse it. The aadhar card literally has all your information. Now do not say, "I have nothing to hide, so I should not be worried about my privacy." It's like saying I do not care about my freedom of speech because I have nothing to say. We all know what you do in a bathroom so why do you need to close the door ? Exactly ! For privacy not secrecy. Are you a retard ? Look at what question he is asking and look at the reply you are giving. Terming the Supreme Court verdict on Aadhaar a breath of fresh air for Indian citizens, cyber law experts on Wednesday said a completely new regime has to be put in place to protect the Aadhaar data that is lying with private companies. Stating that private entities or individuals cannot avail Aadhaar data to provide consumer services, the apex court struck down Section 57 of the Aadhaar Act which allowed sharing of data with private entities. "The Aadhaar verdict is a huge sigh of relief for citizens. The humongous task now is to ensure that the data that is already with private companies is not misused or sold," Pavan Duggal, the nation's leading cyber law expert, told IANS. "The data now needs to be dismantled but the onus is to make sure companies do not make copies of the data and use it to monetise their operations. The big question is which agency will audit this humongous task," added Duggal, also a leading Supreme Court lawyer. The apex court also said that Aadhaar data can't be shared with security agencies in the name of upholding national security and individuals too can complain about theft of their Aadhaar data. "Private companies played a big gamble of integrating Aaddhar data with their systems wherein they spent a lot of money. The whole exercise is now futile and the country now needs a fresh Aadhaar ecosystem," Duggal noted. "Today's judgment as read out in court signals massive changes in the Aadhaar project and the Act. The legitimacy of its stated purposes is destroyed. Even the majority signals significant concern by reading down portions," tweeted New Delhi-based lawyer Apar Gupta. Although experts are yet to read the verdict in fine print, they said the Supreme Court's directive to the Centre to bring a robust data protection law is the need of the hour. "The Aadhaar data is saved in data centres outside the boundaries and law of our country. There is an urgent need for addressing newly emerging legal and cyber security challenges concerning Aadhaar ecosystem on an urgent basis," Duggal said. The Supreme Court, in a landmark judgment last year, declared privacy a fundamental right. This set the government in motion to take steps to bring new data protection legislation for the country. The Justice B.N. Srikrishna Committee submitted the Personal Data Protection Bill 2018 in July, suggesting amendments to the Aadhaar Act to provide for imposition of penalties on data fiduciaries and compensations to data principals for violations of the data protection law. The 213-page report suggested amendments to the Aadhaar Act from a data protection perspective. According to Duggal, "not just cosmetic changes, there is an urgent need for addressing newly emerging legal and cyber security challenges concerning Aadhaar ecosystem on an urgent basis". Supratim Chakraborty, Associate Partner at law firm Khaitan & Co, said the verdict that private parties cannot have access to individuals' data was a double-edged thing. "From a socialistic perspective and individualistic perspective, you need to have proper safeguards as to how your information is being used by a private party. "However, from a business perspective, it could increase their expenses if they need to collect too much information one by one from an individual. It compels us to ponder whether there is a correct way to do business while protecting the privacy of users," Chakraborty told IANS. "This gives much-needed relief to the common public. The limitations about time of storage, on metadata analysis and state interference are important developments for privacy," Choudhury said. In Europe, as part of the European Union's General Data Protection Regulation (GDPR) that came into force from May 25, EU citizens at any point may object to an organisation's handling of their personal data. The regulation specifically names "direct marketing and profiling" as personal data uses to which individuals may object. According to Duggal, India should not cut-paste any other country's law and must strive for data localisation. "There is a need for more comprehensive legal frameworks to protect and preserve data and privacy of individual Aadhaar account holders in specific and the Aadhaar ecosystem stakeholders in general," Duggal noted. Justice Dhananjaya Y Chandrachud, a member of the five-judge constitution bench of the Supreme Court on Aadhaar issue, on Wednesday held that the Aadhaar Act cannot be treated as a money Bill and passing it as one will be a fraud on the Constitution. He also said that since 2009, the entire Aadhaar programme suffers from constitutional infirmities and violations of fundamental rights. "Aadhaar cannot be treated as money Bill and passing a bill as money Bill which is not a money Bill is a fraud on the Constitution," he observed in his separate judgement but minority judgement. Commenting about the Aadhaar programme, he said, "The entire Aadhaar programme, since 2009, suffers from constitutional infirmities and violations of fundamental rights. The enactment of the Aadhaar Act does not save the Aadhaar project. The Aadhaar Act, the Rules and Regulations framed under it, and the framework prior to the enactment of the Act are unconstitutional." Justice Chandrachud said the decision of the Lok Sabha Speaker on whether a bill can be treated as money Bill can be subjected to judicial review. "A decision of the Speaker of the Lok Sabha to declare an ordinary Bill to be a Money Bill limits the role of the Rajya Sabha, he said. The power of the Speaker cannot be exercised arbitrarily in violation of constitutional norms and values, as it damages the essence of federal bicameralism, which is a part of the basic structure of the Constitution. Judicial review of the Speaker’s decision, on whether a Bill is a Money Bill, is therefore necessary to protect the basic structure of the Constitution," he said. While agreeing with the majority on some points, Justice Chandrachud dissented on the main point about money Bill and the principle of proportionality of the applicability of Aadhaar. He said, "Section 7 does not declare the expenditure incurred to be a charge on the Consolidated Fund. It only provides that in the case of such services, benefits or subsidies, Aadhaar can be made mandatory to avail of them. Moreover, provisions other than Section 7 of the Act deal with several aspects relating to the Aadhaar numbers, like enrolment on the basis of demographic and biometric information, generation of Aadhaar numbers, obtaining the consent of individuals before collecting their individual information, creation of a statutory authority to implement and supervise the process, protection of information collected during the process, disclosure of information in certain circumstances, creation of offences and penalties for disclosure or loss of information, and the use of the Aadhaar number for 'any purpose'. All these provisions of the Aadhaar Act do not lie within the scope of sub-clauses (a) to (g) of Article 110(1). Hence, in the alternate, even if it is held that Section 7 bears a nexus to the expenditure incurred from the Consolidated Fund of India, the other provisions of the Act fail to fall within the domain of Article 110(1). Thus, the Aadhaar Act is declared unconstitutional for failing to meet the necessary requirements to have been certified as a Money Bill under Article 110(1)." Coming down heavily on biometric data collection and retention for Aadhaar, the Judge observed that concerns about protecting privacy must be addressed while developing a biometric system. "While citizens have privacy interests in personal or private information collected about them, the unique nature of biometric data distinguishes it from other personal data, compounding concerns regarding privacy protections safeguarding biometric information. Once a biometric system is compromised, it is compromised forever," Justice Chandrachud said. According to Justice Chandrachud, absence of regulatory and monitoring framework leaves the law ineffective in the protection of data. He said, "Biometric technology, which is the core of the Aadhaar programme is probabilistic in nature, leading to authentication failures. These authentication failures have led to the denial of rights and legal entitlements. The Aadhaar project has failed to account for and remedy the flaws in its framework and design which has led to serious instances of exclusion of eligible beneficiaries as demonstrated by the official figures from Government records including the Economic Survey of India 2016-17 and research studies. “Dignity and the rights of individuals cannot be made to depend on algorithms or probabilities. Constitutional guarantees cannot be subject to the vicissitudes of technology. Denial of benefits arising out of any social security scheme, which promotes socioeconomic rights of citizens is violative of human dignity and impermissible under our constitutional scheme." He also observed that there was a risk of surveillance of people based on data collected under the Aadhaar scheme and the data could be misused. "From the verification log, it is possible to locate the places of transactions by an individual in the past five years. It is also possible through the Aadhaar database to track the current location of an individual, even without the verification log. The architecture of Aadhaar poses a risk of potential surveillance activities through the Aadhaar database. Any leakage in the verification log poses an additional risk of an individual’s biometric data being vulnerable to unauthorised exploitation by third parties," he added. Pointing out that the source code for the Aadhaar database is neither owned by the government or Unique Identification Authority of India (UIDAI), Justice Chandrachud, said, "The biometric database in the Central ID Repository (CIDR) is accessible to third-party vendors providing biometric search and de-duplication algorithms, since neither the Central Government nor UIDAI have the source code for the deduplication technology which is at the heart of the programme. The source code belongs to a foreign corporation. UIDAI is merely a licensee." Ripping apart the contracts signed by UIDAI before the Aadhaar Act, which would harm national security, Justice Chandrachud mentioned the contract signed between L-1 Identity Solutions and UIDAI. "Prior to the enactment of the Aadhaar Act, without the consent of individual citizens, UIDAI contracted with L-1 Identity Solutions (the foreign entity which provided the source code for biometric storage) to provide to it any personal information related to any resident of India. This is contrary to the basic requirement that an individual has the right to protect herself by maintaining control over personal information. The protection of the data of 1.2 billion citizens is a question of national security and cannot be subjected to the mere terms and conditions of a normal contract," he said. He said, "When Aadhaar is seeded into every database, it becomes a bridge across discreet data silos, which allows anyone with access to this information to re-construct a profile of an individual’s life. This is contrary to the right to privacy and poses severe threats due to potential surveillance." While the majority judges upheld the linking of Aadhaar with income-tax returns (ITR), Justice Chandrachud junked linking it with permanent account number (PAN) and ITR. He said, "The seeding of Aadhaar with PAN cards depends on the constitutional validity of the Aadhaar legislation itself. Section 139AA of the Income Tax Act 1962 is based on the premise that the Aadhaar Act itself is a valid legislation. Since the Aadhaar Act itself is now held to be unconstitutional for having been enacted as a Money Bill and on the touchstone of proportionality, the seeding of Aadhaar to PAN under Article 139AA does not stand independently." Justice Chandrachud also ripped apart mandatory linking of Aadhaar with all accounts under the Prevention of Money Laundering Act (PMLA) Rules. "The 2017 amendments to the PMLA Rules fail to satisfy the test of proportionality. The imposition of a uniform requirement of linking Aadhaar numbers with all account based relationships proceeds on the presumption that all existing account holders as well as every individual who seeks to open an account in future is a potential money-launderer. No distinction has been made in the degree of imposition based on the client, the nature of the business relationship, the nature and value of the transactions or the actual possibility of terrorism and money- laundering." "The rules also fail to make a distinction between opening an account and operating an account. Moreover, the consequences of the failure to submit an Aadhaar number are draconian. In their present form, the rules are clearly disproportionate and excessive. We clarify that this holding would not preclude the Union Government in the exercise of its rule making power and the Reserve Bank of India (RBI) as the regulator to re-design the requirements in a manner that would ensure due fulfilment of the object of preventing money-laundering, subject to compliance with the principles of proportionality as outlined in this judgment," he said. Mobile phones have become a ubiquitous feature of the lives of people, Justice Chandrachud said, linking of Aadhaar numbers with SIM cards and the requirement of e-KYC authentication of mobile subscribers must necessarily be viewed in this light. He said, "Mobile phones are a storehouse of personal data and reflect upon individual preferences, lifestyle and choices. The conflation of biometric information with SIM cards poses grave threats to individual privacy, liberty and autonomy. Having due regard to the test of proportionality which has been propounded in Justice Puttaswamy (judgement) and as elaborated in this judgment, the decision to link Aadhaar numbers with mobile SIM cards is neither valid nor constitutional. The mere existence of a legitimate state aim will not justify the disproportionate means, which have been adopted in the present case. The biometric information and Aadhaar details collected by telecom service providers (TSPs) shall be deleted forthwith and no use of the said information or details shall be made by TSPs or any agency or person or their behalf." Justice Chandrachud also raised questions on contractual validity of memorandum of understanding signed by UIDAI with registrars. He opined since there was no privity of contract between UIDAI and the enrolling agencies, the activities of the private parties engaged in the process of enrolment before the enactment of the Aadhaar Act have no statutory or legal backing. Under Section 47(1), a court can take cognizance of an offence punishable under the Act only on a complaint made by UIDAI or any officer or person authorised by it. Terming Section 47 as arbitrary for its failure to provide a mechanism to individuals to seek efficacious remedies for violation of their right to privacy, Justice Chandrachud said, "Further, Section 23(2)(s) of the Act requires UIDAI to establish a grievance redressal mechanism. Making the authority, which is administering a project, also responsible for providing a grievance redressal mechanism for grievances arising from the project severely compromises the independence of the grievance redressal body." "While the Act creates a regime of criminal offences and penalties, the absence of an independent regulatory framework renders the Act largely ineffective in dealing with data violations. The architecture of Aadhaar ought to have, but has failed to embody within the law the establishment of an independent monitoring authority (with a hierarchy of regulators), along with the broad principles for data protection. This compromise in the independence of the grievance redressal body impacts upon the possibility and quality of justice being delivered to citizens. In the absence of an independent regulatory and monitoring framework which provides robust safeguards for data protection, the Aadhaar Act cannot pass muster against a challenge on the ground of reasonableness under Article 14," he said. Strongly opposing use of Aadhaar for commercial purposes, Justice Chandrachud felt this could led to exploitation of personal data of individuals without consent and individual profiling. He said, "Profiling could be used to predict the emergence of future choices and preferences of individuals. These preferences could also be used to influence the decision making of the electorate in choosing candidates for electoral offices. This is contrary to privacy protection norms. Data cannot be used for any purpose other than those that have been approved. While developing an identification system of the magnitude of Aadhaar, security concerns relating to the data of 1.2 billion citizens ought to be addressed. These issues have not been dealt with by the Aadhaar Act. By failing to protect the constitutional rights of citizens, Section 57 violates Articles 14 and 21". According to Justice Chandrachud, Section 7 of the Aadhaar Act suffers from overbreadth since the broad definitions of the expressions ‘services and ‘benefits’ enable the government to regulate almost every facet of its engagement with citizens under the Aadhaar platform. "If the requirement of Aadhaar is made mandatory for every benefit or service, which the government provides, it is impossible to live in contemporary India without Aadhaar. The inclusion of services and benefits in Section 7 is a pre-cursor to the kind of function creep, which is inconsistent with the right to informational self-determination. Section 7 is, therefore, arbitrary and violative of Article 14 in relation to the inclusion of services and benefits as defined," he concluded in his judgement. Is online delinking process available? Jce DYC's reasoning appears logical and well reasoned out. What about claiming to withdraw part of employee PF from PF account? Does it need to apply OTP from adhaar registered mobile number?